Here’s the final post in Lucia’s beautiful Theology of the Body series! After knowing of God’s immense love, a woman can go forward with finding out what God calls her to. This response is not immediately one of vocation to married or religious life, but rather a call to respond to God’s love. When one knows that they are loved by another, they desire to give themselves completely to that person in love. It is in such an act that we truly find out who we are. As St. John Paul II points out, “Man cannot fully find himself except by making a sincere gift of himself”. By receiving God’s love and then giving ourselves in love and trust to Him, we truly become who we were created to be. I started out my second blog post with the theme of hope. Hope: What do I mean by this? How does this relate to the Theology of the Body and how it expresses the Gospel message? Amidst your experience, whether it is one of joy and freedom or pain, suffering, and low self-esteem, how is God leading you to hope? How is He calling you to happiness and the desires of your heart? You have great desires for to love and be loved, and He has put those desires in your heart for a reason. Allow Him to guide you ever closer to Himself through these desires! God wants to marry us. St. John Paul II expressed this beautifully, “With an act of redemptive love, Christ loved the Church and gave himself up for her. By the same act he is united with the Church in a spousal manner, as the husband and wife are reciprocally united in marriage instituted by the Creator.” (TOB, Audience 93). Even if you are not giving your life in the radical vocation of religious life, this still is very true. God created each of us for a deep and intimate union with Him, and our vocation is only the means by which we enter into a deeper relationship with Him. Now, ask yourself, “Do I truly believe this and live this out? Do I believe that even if I am not a religious that God is still calling me to a deep personal relationship, and not only that, but that He has a particular and irrepeatable mission for me? 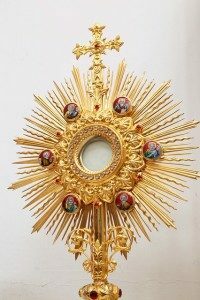 Do I believe that I am called to an intimate relationship with Christ, based not on what I do, but rather the fact that He loves me unconditionally?” Sit with the Lord and go through asking these questions with Him. Allow Him to stir the deep desires of your heart that are so beautifully put there by Him, and He will lead you to find out who you truly are. 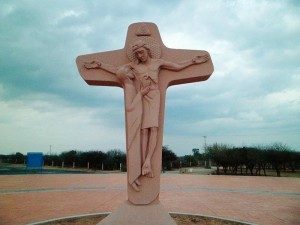 The image of the Schoenstatt Unity Crucifix in this post is used under a Creative Commons Licence, and the owner is Enrique Lepez-Tamayo Biosca.